How Important To You Is Sunshine? How much sunshine, when and where? CityNews Toronto - Shedding Light on the Core - Our TV news interview in connection with Toronto's Downtown Plan that aims to preserve sunlight on downtown parks. GlobalTV National News - Top Story - What Happened at that Rural Intersection in SK? - Our TV news interview in connection with the Humboldt Broncos bus crash. Virtual Modeling of Tall Buildings - Sun & Shadows - presented by R. Bouwmeester at the Higher Learning Symposium held in Toronto, Ontario, on October 19, 2006. The event was co-sponsored by the City of Toronto, the Canadian Urban Institute and the Toronto Society of Architects. Sun and Shadow Modeling in Accident Reconstruction, presented by R. Bouwmeester to the Canadian Association of Technical Accident Investigators and Reconstructionists (CATAIR), Ontario Region, on February 18, 1997. Baghdad, Kabul and Kuwait City. Free sunrise/sunset table for the Toronto2015 Pan Am and Parapan Am Games to be held in Toronto Canada in July and August 2015. Free sunrise/sunset tables are available for those of you who visited Vancouver and Whistler BC during the Olympics and Paralympics in February and March 2010. Free sunrise/sunset tables are available for those of you who visited the London 2012 Olympics and Paralympics. Cities include London, Manchester, Glascow and Cardiff. Free sunrise/sunset tables are available for those of you who visited the Sochi 2014 Olympics and Paralympics. Free sunrise/sunset tables for the Rio 2016 Olympics and Paralympics. Free sunrise/sunset tables for the PyeongChang 2018 Olympics and Paralympics. 2018 Halloween sunset times added for select Canadian and US cities. Torontohenge info for October 2017. Torontohenge info for October 2014. Sunrise/Sunset Tables for Port-au-Prince, Haiti and Sendai, Japan were added in support of those involved in rescue and relief work. The tables provided rise and set times and the total number of hours of available daylight for each day of the month. To assist wildfire victims and firefighters in Slave Lake, Alberta, a table of daily sunrise/sunset times and hours of daylight was posted shortly after the fires. Similarly, a Kathmandu, Nepal sunrise/sunset table was added to assist in the 2015 earthquake rescue efforts. To assist wildfire victims and firefighters in Fort McMurray, Alberta, a table of daily sunrise/sunset times and hours of daylight for May 2016 was posted. To assist the August 2016 earthquake victims and rescuers in Amatrice, Italy, a table of daily sunrise/sunset times and hours of daylight was posted. Sunrise/Sunset Tables are available for any dates and locations. The current month for your location is free upon request. 2. Rise/Set Times, Azimuths of Rise/Set (great tool for photographers). Rise/Set Times in Monthly Calendar Format. 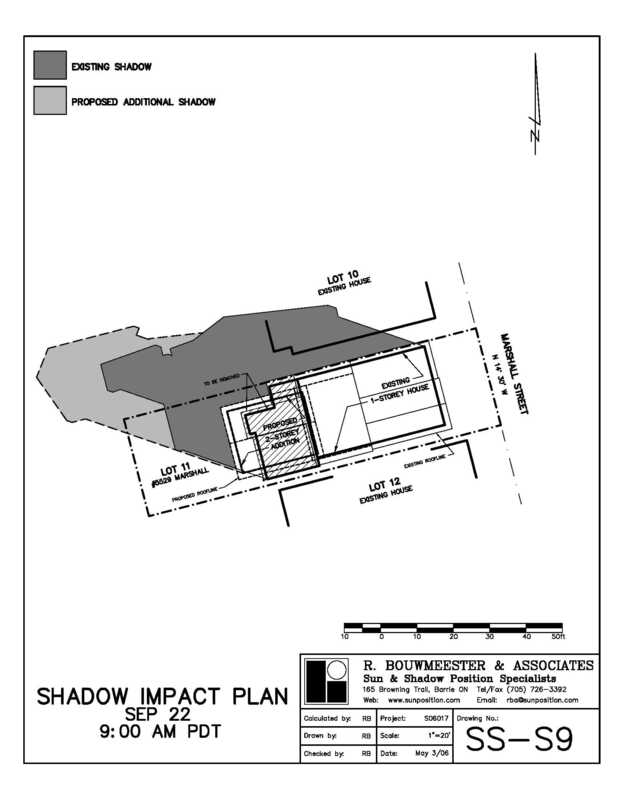 Shadow Impact Assessments - related to proposed development and building projects - we have represented proponents as well as objectors. Project types range from proposed house additions to 75-storey condo developments. 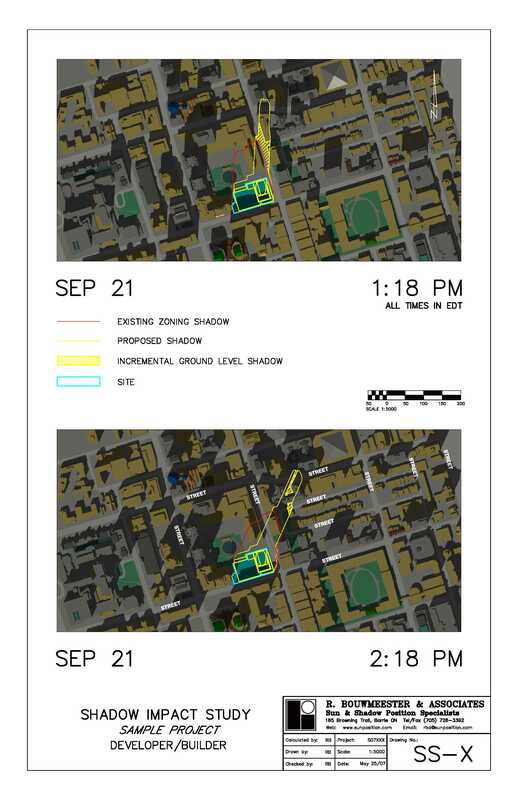 Solar Access Studies - related to passive solar energy, architectural daylighting, and pedestrian comfort. Collision & Crime Scene Reconstruction - related to the investigation and reconstruction of collisions of all kinds (e.g. involving pedestrians, cars, trucks, buses, trains, aircraft and watercraft) where sun glare or blinding is suspected to have been a contributing factor, and crime scene reconstruction where there are issues related to visibility / ambient lighting / suspect identification. We also provide forensic shadow analyses of photos and videos to determine and/or confirm the date and time they were taken. Our analyses assist in establishing timelines and proving/disproving witness statements in criminal, civil and collision investigations. Frito-Lay SunChips Solar Billboard - See this YouTube page for a time-lapse video of the SunChips 'solar' billboard installed in Oakland California on Earth Day 2008 to celebrate the opening of Frito-Lay's solar-powered SunChips plant in nearby Modesto. The shadow casting components of the billboard were designed by R. Bouwmeester & Associates. Ad agency Juniper Park of Toronto took home the 2009 Cassies Grand Prix on January 28, 2010, for the ad campaign that included our billboard. See story. Air India Flight 182 Memorial Sundial - R. Bouwmeester & Associates was commissioned by the City of Toronto to design the sundial feature which is central to the Air India Flight 182 Memorial unveiled on the Toronto Ontario waterfront by Prime Minister Stephen Harper on June 23, 2007. NASCAR Track Sun Angle Diagram - NASCAR Sprint Cup driver and six-time champion, Jimmie Johnson, told me via Twitter on October 25, 2014, that "The late stages at PIR are tough with the sun in your eyes." In response, I prepared a sun angle diagram for the next Sprint Cup race at Phoenix International Raceway (PIR) scheduled for Sunday, Nov. 9, 2014. Canada 150 Solar Event - visible across Canada on July 1, 2017. Page added June 27, 2017. Sun Glare Poses Challenge to Drivers, March 2019 interview with Debbie Lazaga on Milwaukee's WTMJ Radio about the challenge that sun glare poses to drivers. Copyright © 2002 - 2019, R. Bouwmeester & Associates. All Rights Reserved.